Iddi Hamis Nyachenga is the winner of the 2018 edition of the annual WWF Africa Youth Conservation Award. The annual award aims to give Africa’s youth a platform to engage with thought leaders in conservation and building a movement of young people engaged in conservation. Iddi is among the three shortlisted nominees from WWF country offices spanning East Central and Southern Africa. The other runners up for the coveted award are Marie Christina Kolo from Madagascar and Imaoga Unelker from Kenya. 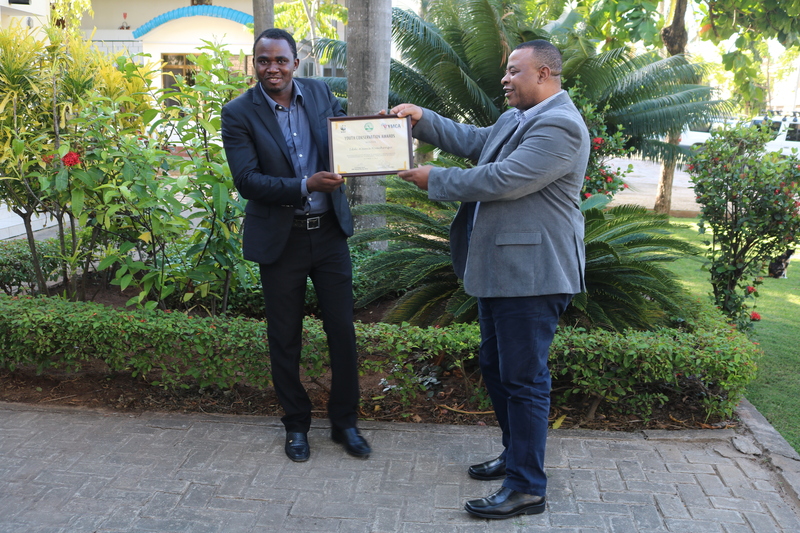 Iddi received his award from the WWF Africa Regional Director, Fred Kwame Kumah during the organizations global conservation and practice forum in Livingstone, Zambia. Mr Kumah reiterated his commitment to work with the youth in Africa and promised to build a WWF Youth platform in Africa over the coming years when presenting the award to the overall winner. “Africa is the most youthful continent with about 65% of the total population below the age of 35 years. By 2020, it is projected that out of 4 people, 3 will be on average 20 years old. The World Wide Fund For Nature (WWF) seeks to empower youth all over Africa through the Pan-African youth transformational program. The future of conservation in Africa will be determined by the networks of informed youngsters rising and making a change in their lives and those around them towards creating a better Africa,” said Mr Kumah. In addition to his award, Iddi will also participate in the upcoming CBD CoP14 through the sponsorship of the YMCA in November 2018. His engagement at the conference will be alongside other youth from around the world. He is the founder and CEO of the Green Power Group and a member of the Tanzania Recyclers Association (TARA). Green Power Group aims to support the environmental advocacy conservation through sustainable alternative energy provision for household and industrial needs and eventually stop deforestation and climate change impacts. After registering the group in 2016, Iddi mobilised youth in his community and created 10 permanent jobs. 8 of Iddi’s employees are female. The youth group has created a product known as MKAA WA IDRIS, which is a carbonized charcoal briquette manufactured from biomass wastes like peanut shells, rice husks, coconut shells, sawdust and other agricultural by-products. Their charcoal is cheaper than wood charcoal and other cooking alternatives. Apart from creating the machine, Iddi and his team have also initiated a program of raising awareness in tree planting and environmental conservation products to youth from secondary schools, universities and women groups. First runners up, Imaoga Unelker from Kenya is the founder of a community based project on climate change, known as Konservation. Maoga works with youth and women to raise awareness about climate change and mitigation whilst increasing access of solar lanterns in homes that lack access to electricity in rural Kenya. Maoga has organised and engaged in dialogues on climate change through the Africa Youth. She has also convened environmental clubs and supported the development of activities such as beach clean ups and establishing indigenous tree nursery. She has worked in a multi-disciplinary team on a dairy value chain project. “I want to offer solutions to the challenges that Africa faces,” she says. But what else would you expect from someone who reads books like Wangari Maathai’s “The challenge for Africa?’ says Unelker. Final runners up, Marie Christina Kolo from Madagascar, is a climate change activist. She started her own business known as Green and Kool focusing on waste collection, recycling and environmental education with a cultural training center dedicated to youth and women. The business has grown since 2016 with 15 employees and 6 youth entrepreneurs supporting the cause. The business has significantly grown since its foundation with social incubator being able to collect waste from 6 areas of the city, a green school and a restaurant. The WWF Africa Youth Award is designed to recognize and celebrate young adults throughout Africa who have developed innovative projects, practices, activities and solutions to the sustainable development challenges facing our continent today. It is open to young people aged between 18 and 35 and WWF offices in Africa make nominations.